This model of pendant is a perfect complement to the styling of your humbag. Made of black eco-l.. This is the second model of long pendant that can revive your humbag. Made of brown eco-leather..
Made of subtle tint black eco-leather with a length of 14 cm. Eco-leather elements were finishe..
Made of black eco-leather with a length of 14 cm. Eco-leather elements were finished with gold-..
Made of black eco-leather with a length of 14 cm. Eco-leather elements were finished with silve..
Made of subtle tint blue eco-leather with a length of 14 cm. Eco-leather elements were finished..
Made of subtle tint orange eco-leather with a length of 14 cm. Eco-leather elements were finish..
Made of subtle tint pink eco-leather with a length of 14 cm. Eco-leather elements were finished.. 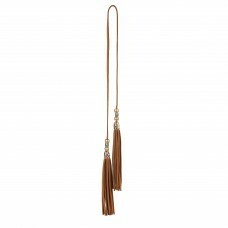 This pendant, like the black fringe, is an iron "position in the decorating of your bag humbagMade o.. This pendant is the firm and brave proposal in decorating of your bag humbag.Made of mottled golden ..